I don't know about you, but I spend quite a bit of my "free" time cleaning the house, or in the kitchen cooking. So why not make housework a little more fun? Tie on one of these adorable aprons from Pink Butterfly Aprons and I bet it will make you feel a little more cheerful. I was recently given the opportunity to review the Ashley apron (shown at left) and I love it! (This apron also is available as a mommy & me apron set.) I own a lot of cute aprons, but this apron is probably one of the nicest I have ever worn. The fabric is made of a durable, high quality cotton, that is lined so if you spill something on your apron, it won't soak right through to your clothes. This apron also has a lot of really pretty details including a fun yellow piping that runs the entire edge of the apron, and on the pockets! The pockets are also a nice feature, they are a good size and are handy to have when you're picking up. 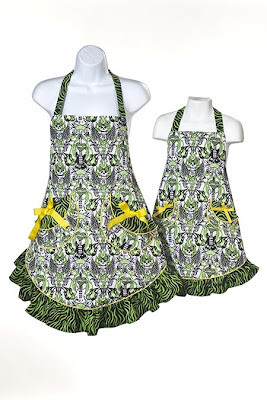 The Ashley also has a really cute green & black zebra ruffle that gives the apron a feminine touch. These aprons are so adorable - they would make the perfect bridal shower or housewarming gift! Though I'm sure your friends and family wouldn't turn them down at any occasion - why not give one to your favorite holiday hostess? From their website: "Pink Butterfly™ Aprons are designed, sewn and distributed in the USA. In addition, the fabric is prewashed and dried to minimize shrinkage. Another special touch our customers appreciate is that most of our aprons are lined or reversible which provides extra protection and more versatility." 4. Subscribe to my blog via email or feedburner. You have until Monday, April 16 @ 7pm EST to enter! (Winner must respond within 48 hours.) Giveaway open to U.S. residents only. * I was provided with a product in order to write this review - all opinions are my own. Thanks for the chance to win! My email is hannahjholmes at gmail dot com. I like Pink Butterfly Aprons on Facebook! I like the Nantucket apron. I love the Candace. So much fun! Love your site, as well. My favorite is the Serenity apron. Thanks. I Like Frugal & Fabulous on Facebook! I love the "Lotus and Miss Lotus" aprons. I am following Pink Butterfly Aprons on facebook. I am torn between the KATE and Carol-Anne. They are both so darn cute! I love the Lola III apron....but there were so many cute ones! I liked Frugal & Fabulous on Facebook for another entry. I looked through them all and the three tiered Lorena apron is my favorite! I like the Kate apron and the Serenity apron. Kristie Donelson. I like the Felicia apron. So cute! kristiedonelson(at)gmail(dot)com Thank you. Like Frugal and Fabulous on Facebook. Kristie Morrison Donelson. kristiedonelson(at)gmail(dot)com Thank you. Like Pink Butterfly Aprons on Facebook. Kristie Morrison Donelson. kristiedonelson(at)gmail(dot)com Thank you. Follow Pink Butterfly Aprons on Twitter. @kdonelson kristiedonelson(at)gmail(dot)com Thank you. Miaka is a really cute apron. There are so many cute ones! My favorite apron is the Carol-Anne. I Like Frugal & Fabulous on Facebook. I Like Pink Butterfly Aprons on Facebook. I Follow blog on Google Friend Connect. I Subscribe to blog via email or feedburner. I Follow blog on twitter. I Follow Pink Butterfly Aprons on Twitter. My favorite is the Tiffany. I liked Pink Butterfly on FB! I follow Pink Butterfly on Twitter. These are too cute! I love the Mommy and Me Sheila with all the cute cupcakes. I like the Molly apron. My favorite apron is Miranda. LOVE it!! I love the Miss Hayley apron! Saladgoddess already following PinkButterfly on Twitter.